No postage required. 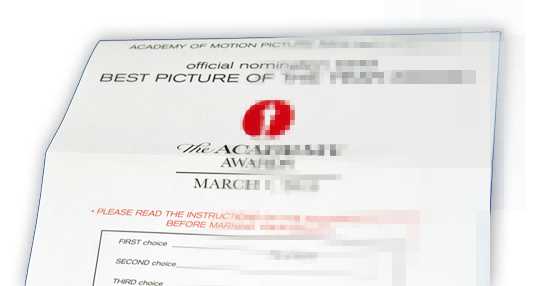 The Academy is looking to ditch snail-mail voting. Before next year's Oscars, the Academy plans to "undertake a rigorous security and user-acceptance testing process" for an electronic voting system, the organization announced Wednesday. 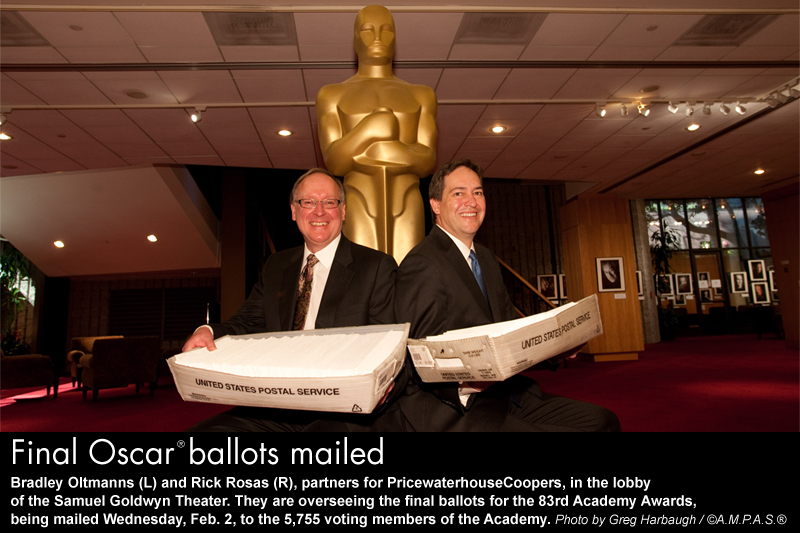 The Academy is partnering with Everyone Counts Inc. to "exclusively develop an electronic voting system for the 85th Academy Awards, to be held in 2013," according to the press release. PricewaterhouseCoopers (PwC), the current paper ballot tabulator, will remain as the accounting firm of record. The selection of Everyone Counts is the result of an 18-month search conducted by the Academy. The company is recognized around the world for its expertise in election administration and computer security. Its voting platform is a global leader in the election industry. Built into its technology and processes are multiple layers of security that include "military-grade encryption techniques." The company’s clients include the United States Department of Defense; the United Kingdom’s Ministry of Justice; the state of New South Wales, Australia; and the states of Oregon, Florida and Washington. The New York Times reported last May that the Academy would begin electronic voting for the Oscars as earlier as 2012. Last year's Academy Awards were the most interactive for audiences in Oscar history and it appears the Academy is looking to extend its burgeoning use of technology to its members. The Gold Knight even complimented the Academy for its use of technology, saying that it "has been showing off its technological prowess." Find more information about Everyone Counts here. The Academy is going ahead with e-voting for the 85th Academy Awards, it confirmed on Sept. 18. The announcement of Oscars nominations was moved five days earlier — than the date announced in March — to Jan. 10, 2013, "in an effort to provide members and the public a longer period of time to see the nominated films," according to the Academy. In order to help members with voting, the Academy is installing assisted voting stations in Los Angeles, New York and London, a 24-hour telephone help line during voting periods, and paper ballots. Electronic voting will be an option for members in specific categories. "In the pre-Nominations phase, members will continue to vote via paper ballot in eight categories due to specialized screening schedules and processes," the news release said. "Those categories are Animated Feature Film, Animated Short Film, Live Action Short Film, Documentary Feature, Documentary Short Subject, Foreign Language Film, Makeup and Hairstyling and Visual Effects."